Gather high-quality mailing and subscribers list with A.I. real-time email verifier. ZeroBounce integrated into your Magento store detects invalid, risky and fake email addresses with 98% accuracy based on the following parameters: spam abuse, spam traps, toxication, MX record, catch-all, etc. In the result, the deliverability of your emails will be increased and you’ll get a healthy mailing list. Before using the extension, you need to register on the zerobounce.com, get credits and start checking emails directly in your store. If you are worried about email bouncing rate, it’s time to use an in-depth email list cleaning. 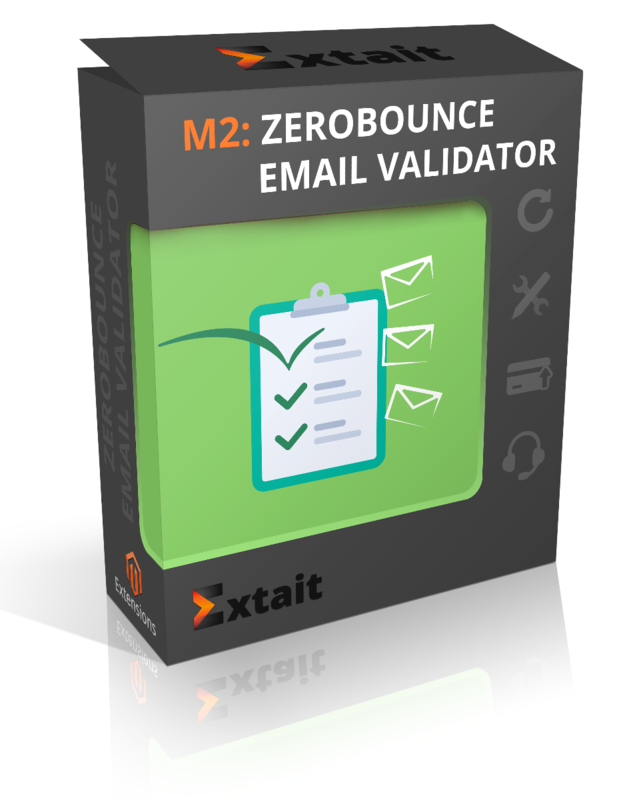 ZeroBounce is the reliable email validation tool which helps to detect different kinds of bad and risky emails in real time. As well, you’ll get a more complex report with email quality score carried out by A.I. With the help of ZeroBounce verifier, you can avoid spam traps, toxic domains, bots, abusive email users, dangerous catch-all emails, etc. In addition, you have the ability to personalize your emails as it can provide some missing information from email accounts. The module gives you the opportunity to enable a real time email verification on your registration, checkout, subscription, customer edit and contact forms. With the integration to Magento platform, you can take an advantage of the most complete and flexible validation system on the marketplace. The extension determines email addresses which belong to so-called email complaniers, i.e. marking emails as spam. It separates them in mailing reports and it’s your turn to use them for mailing or don’t. Spam traps are used by bots to catch your mailing and do harm to your sender reputation. Sometimes your domain can be blacklisted. Thus, it’s vital to weed them out from your list and decrease such risk in your database. High email bounce rate signifies that your mailing list is messy and needs to be cleaned. Applying email cleaning system, you can easily identify emails which will bounce or can’t be reached. So, you can get rid of invalid, abandoned and fake email addresses and control delivering and bounce rate. Detect temporary addresses that self-destruct after a certain time. Many forums, websites and blogs ask to register before they can download something, view content or leave comments. That’s why some visitors use these fake emails to avoid possible future spam. But you can clear them from your list. Email checker finds the full name, gender and location of a certain email user. You’ll get not only a complex email scrubbing service but also a possibility to enrich your email list with missing information. It will assist you in getting to know customers better and segmenting offers provided with personalized content. Catch-all domains don’t have a purpose to remove or bounce your email. They are created to receive all to one inbox and not to lose any emails. But some of these domains may have a firewall or other spam tool to let you down. With ZeroBounce, you find out the quality score of how risky catch-all emails in your list are and decide which addresses to leave. Email addresses that were known for abuse, sending spam, or bot created emails can be identified in your mailing list with the use of extension. One more point to be on the safe side of your mailing. See all statistics for your mailing list. The report will reveal top domains and their total number, validation results segmented by statuses, social and IP location data appends. Moreover, you can select the results of cleaning that you are interested in to download. Specify certain domains to be blocked on your site. You can ban spammer and suspicious domains to make your security level higher. Or exclude gmail.com so that users type in only business addresses. Indicate length of time the domain can exist. If the domain was recently registered, so the possible risk of fraud is high. And you also can prevent any attempts to access the site for domains which might be temporary. - Different texts of error messages depending on validation status type.